Technically, to be a “true” Root Vegetable, the vegetable should meet two conditions: grow underground and play the role of a root for the plant, absorbing moisture and nutrients from the ground. The following vegetables are examples of true Root Vegetables: Carrots, Horseradish, Radishes, Rutabagas, Parsnips, Salsify, and Turnips. They are actually the taproot of the plant, which is formed from the very first root that the seed put out. Generally, though, the term is used for any underground part of a plant that we eat. Even though onions and leeks are both related, we would call an onion a Root Vegetable but not a leek, as leeks grow aboveground. Root Vegetables have never been very fashionable. Throughout history, they were largely seen as peasant food. And no new fans are being won with people applying to Root Vegetables the current fashion of undercooking vegetables: almost all Root Vegetables need to be well cooked, and can’t be eaten raw. 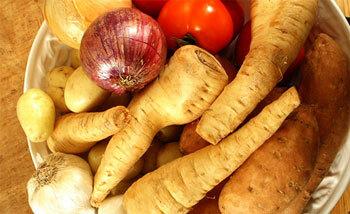 Most hearty eaters, though, love their “root veg”, as they affectionately refer to them. Bulbs of a plant that grow underground, as in onions and garlic. Corms are underground stems that grow vertically. Celeriac, Eddo, Taro and Water Chestnuts are corms (even though Water Chestnuts grow underwater, not underground.) Corms store starch for the plant. Rhizomes are stems that grow horizontally underground. Off of rhizomes grow roots, and the parts of the plant that will appear above ground. Ginger, Galangal, Kratchai, and Turmeric are rhizomes. Tubers are underground stems. They grow in thickness instead of length. Adherents of the Jainism religion do not eat any Root Vegetables, because harvesting them requires killing the whole plant.